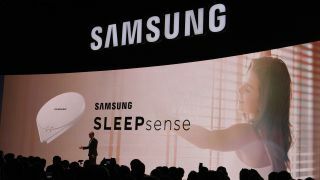 Samsung is trying to creep into your bedroom with its new SleepSense that is set to try and improve the quality of your snoozing. SleepSense is a sensor you place under your mattress, pair with an app and then you can monitor your sleep directly from your mobile phone. The sensor reports the quantity and quality of your sleep and gives you a series of recommendations on how to improve it. You're given a sleep score calculated by your total sleep time, sleep efficiency, the time it took to fall asleep, number of times you woke up, number of times you got up, time in REM and time in deep sleep. There's even a smart alarm that will wake you up slowing and gently rather than jolting you awake like your alarm clock does. SleepSense will also work with a number of other Samsung smart appliances to help you sleep pattern including air conditioning control and turning the TV off when you've gone to sleep. Dr. WP Hong said, "By 2020 all devices made by Samsung will be IoE enabled. It's important IoT is not driven by technology, but by people's expectations. Only then can it blend into our lives. "IoT will help create smarter cities, smarter nations and eventually a smarter world." This is set to be one of Samsung's many interconnected devices that will make your home feel like you're in The Jetsons.